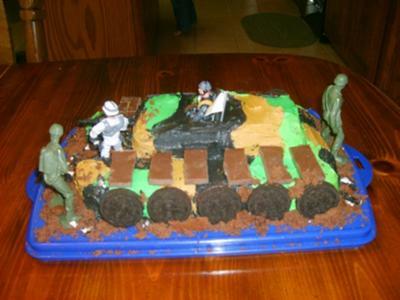 I made this army tank cake for my son's 5th birthday and he was so excited about it. The cake is an 8x10 sheet cake with a loaf pan for the top of the tank. I made 4 different color icings, black, brown, dark green and lighter green. I just splotched it on in different places to give it the camo look. I used oreo's for the wheels, and the top lid I broke one in half and dug out a little bit of the cake and then placed a soldier inside. I used a piece off of one of the tanks my son has for the gun in the front. I used Hershey bar pieces for the tracks on the sides. Then I used some of the extra cake for dirt around the tank, and crushed oreo's. I just made a little sign for the side with my son's name and age for the name of the tank. It was a fun cake to make and not too difficult. WHAT A CLEVER CAKE AND SUCH A GOOD IDEA. IT IS SO FUNNY HOW DIFFERENT IDEAS COME INTO YOUR HEAD. I LOVE SEEING THESE CAKES AND ALL THE EFFORT PEOPLE PUT INTO THEM. AND MOST OF ALL THE KIDS OR WHOMEVER ARE ALWAS SO EXITED. THAT IS SO GREAT..